Hundreds of demonstrators have clashed with riot police in Latvia's capital, Riga, after an anti-government protest. 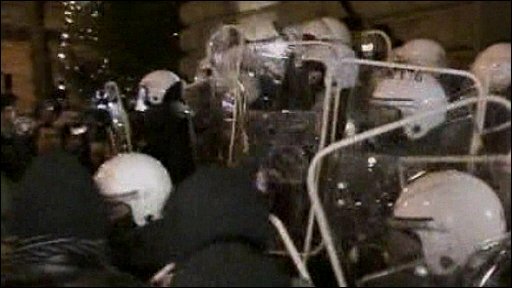 Police used mace and truncheons to disperse rioters who smashed shop windows and overturned a police van after failing to storm parliament. The violence followed a peaceful rally in which some 10,000 people accused the government of economic mismanagement and demanded new elections. Latvia's economy is expected to contract by at least 5% this year. Until last year, it was one of the fastest growing economies in Europe. Many Latvians frustrated by rising unemployment and tax hikes blame the centre-right governing coalition of Prime Minister Ivars Godmanis for their country's economic woes. 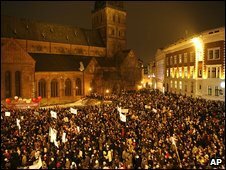 Tuesday's peaceful protest was Latvia's largest since it became independent in 1991. As the crowd swelled, dozens of protesters tried to storm the parliament building, and hundreds of demonstrators then hurled rocks and chunks of ice at government buildings. The rioters were dispersed by riot police using mace and truncheons, but they gathered again in a neighbouring street in Riga's historic business district. 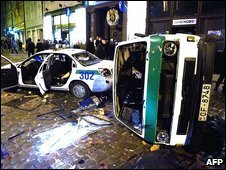 There, they overturned a police van, smashed windows and looted shops. "There was a nice event and then when it finished people decided to go and express their anger and destroy the parliament and then it all spread through Old Riga," Anna Gulbe, 19, told the Associated Press news agency. More than 30 people were injured in the fracas, medical sources said. Interior Ministry spokeswoman Sigita Pildava said three police officers were seriously wounded. She added that 126 mostly young, male protesters were detained, many of whom were drunk. Police reinforcements were called in and the protest was brought under control after about three hours.